Often by now things are winding down during a smattering of appointments spread out between today and tomorrow. But since there is no “tomorrow” per se – this year SIHH is one day shorter than in years past, with Thursday being the public day – we hit the show floor on a mission. 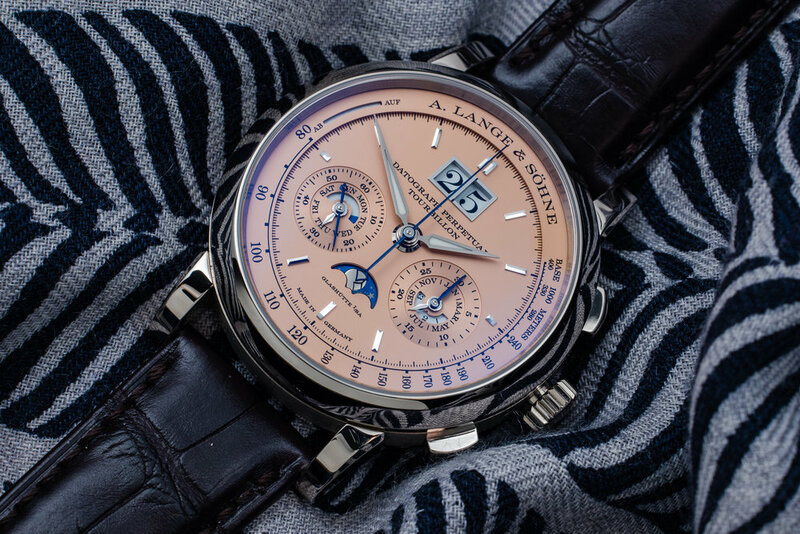 Traditionally, we bookend our SIHH experience by making Lange our last stop. Not only do we go out on a high note, but with Radegast beer and pretzels to help speed us on our way. As it so happens, this time around they were our first stop on Day 3, so we reluctantly declined the beer. Yes, yes, I know it’s always 5 pm somewhere on the planet, but given the amount of ice cold margs I pounded the night before, prudence seemed to be the best course of action. Per usual, Lange can do no wrong. For 2019, they continued their predictable winning streak with a portfolio of absolute stunners, starting with the sublime Zeitwerk Date. As the name implies, the standout feature of this latest in a long line of mechanical digital Langes is the addition of a date complication, which on the surface may seem a simple matter. However, given the nature of the Zeitwerk, in practice it is anything but. Moreover, the way that it has been implemented is as seamless as possible. For many, the lack of a date is preferable, but in this instance I’m going to forgive it simply because it brings the time-only Zeitwerk on par with more practical timepieces, yet retains its resolute quirkiness. I wants it, I does, but I’m pretty sure that this is a close as I’m probably gonna get in my lifetime. The same applies x100 to the Datograph Perpetual Calendar, re-released in a limited edition of 100 pieces for 2019 in white gold with a delightful contrasting pink gold dial. I’m not sure what I can say about this watch that Atom’s pictures can’t say a thousand times better, other than that, in spite of his prowess behind the lens, it’s even better in person. Also on display were the Lange 1 “25th Anniversary” in white gold, the Langematic Perpetual in Lange’s proprietary Honey Gold, and, finally, the Richard Lange Jumping Seconds in white gold with a sober black dial. Winners, the lot of them, and the lot of them are sadly out of my reach, However, for the lucky few able to strap them on, I salute you. I can only hope that some of them fall into the hands of RedBar members so that I can get hands on once more. A few words on their booth. Unlike the shock and awe that all but defines IWC’s booth year after year, Lange’s booth remains a subdued, elegant redoubt that relies on familiar cues. This year, however, a cheekier side of the brand was on display with a section dedicated to the Germany of 25 years ago, when the West and the East were split down the middle. The centerpiece? A Trabant sawed in half and attached to the side of a wall depicting the Berlin Wall. I have it on good authority that said Trabi was purchased for a grand total of $800. Money well spent, in my opinion. In particular, Det. Lamdin looked every bit the Stasi operative behind the wheel that we all know him to be. Our second stop of the day was at Jaeger-LeCoultre for their group press conference. Yet another break with tradition, since in years past we always kicked off the show with a morning appointment at 9 am in their shooting room. However, it mattered not one whit whether they were first on our schedule, or last. For 2019, La Grand Maison did as they always do, quietly wowing us with their subtlety and quiet expertise. Their big story was the exhaustingly appelated Master Grande Tradition Gyrotourbillon Westminster Perpétuel, which shall heretofore be referred to as the Gyrotourbillon 5. Why 5? Because this is the fifth installment in the Gyrotourbillon series, which goes all the way back to 2004. Obviously, the centerpiece of any watch in this series is the tourbillon, which earns its “gyro” prefix by virtue of a multi-axis flying tourbillon escapement. For the Gyrotourbillon 5, this miniature marvel has been miniaturized even further. This not only has the effect of reducing the thickness of the piece, but also aids in its precision. The “Westminster” in the name refers to the Gyrotourbillon’s unique minute repeater, which, thanks to its four separate gongs, can play the entire Westminster chime. Add to this a perpetual calendar that can be set forward and backward, and then top it off with one of the most beautiful guilloché’d enamel dials I’ve ever laid eyes on – all crafted entirely in house by their master enamelers. With this, you’ve got a proper contender for Best In Show. If it weren’t for the Vacheron Constantin Twin Beat, it would be a lock. Speaking of that dial, it also makes an appearance on two other limited editions: the Master Ultra Thin Perpetual Enamel and the Master Ultra Thin Moon Enamel. Both are equally gorgeous and will be offered to the public in a series of 100 pieces. That said, my heart belongs to the Reverso Tribute Small Seconds, now available in steel with a lovely wine-colored dial and a matching Fagliano-type calf strap. It’s a close call between it and my US edition. Laurent Ferrier’s booth in the “Carré des Horlorgers” is always one of our favorite stops of the show. The Patek-trained, third generation watchmaker and ex-race car driver is a sort of horological Santa Claus, not only because of his appearance and demeanor, but also because of the watches he brings to life for good little boys and girls the world over. 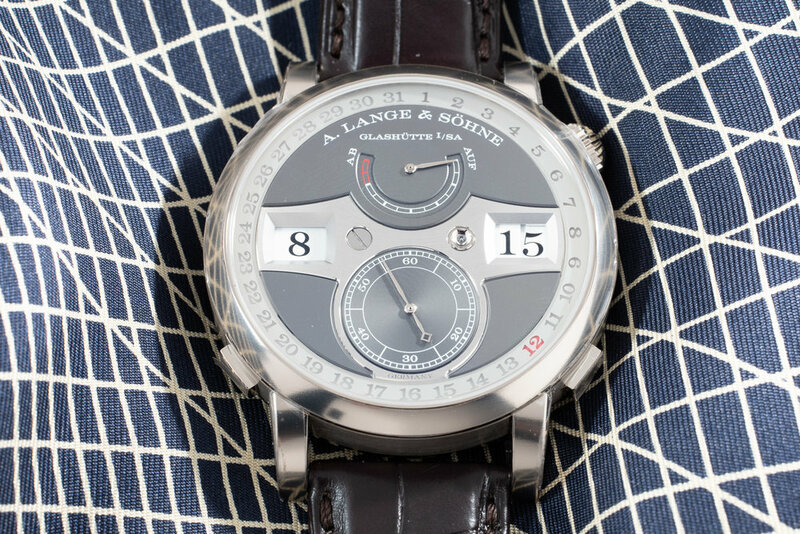 Personally speaking, LF hits each and every note that I look for in a true independent, and it’s one of my life goals to someday add his Galet Annual Calendar Montre Ecole to my collection. Speaking of said Galet Annual Calendar Montre Ecole (one of my favorite releases from SIHH 2018), the collection has been mildly updated with a slightly bolder dial and new dial colors and case materials. If I’m being honest, the gray dial in stainless steel from last year remains my favorite iteration. But the new black dial in yellow gold is a close second. The big story from LF this year is the Bridge 1, representing a huge aesthetic departure for the brand. Inspired by the Arpal One piece unique developed in collaboration with Urwerk for Only Watch 2017, the Bridge 1 is the first production tonneau case from the manufacture. And boy, is it different; all swooping curves and architectural flourish. The watch takes its name from the Passarelle de l’Ile in Geneva, which Mssr. Ferrier could see from his childhood bedroom. Of course, this being LF, an entirely new movement needed to be created that would fit the novel case shape, hence the LF107.01 under the hood. As with all of his movements, it’s expertly finished and decorated. From LF it was off to Romain Gauthier for Atom to photograph an embargoed watch, so sorry, folks, nothing to see here. However, while I waiting for him to finish, I noticed a suspicious individual slinking his way through the salon. When I moved to intercept, he was revealed to be none other than Irish watchmaking superstar, Stephen McGonigle of McGonigle Watches. While his story can be told another time, this sort of thing happens all the time at SIHH, particularly with respect to the independents, who, in spite of what you might think, support each other like brothers and sisters in arms. Yes, I would kill to own any of their watches, but the Ceol Minute Repeater is my Holy Grail. I said last year that Montblanc came into its own as a watchmaker, having shed any lingering carpetbagger nonsense that stemmed from its main business as a purveyor of pens and leather goods. I was wrong. Sort of. While I do stand by that statement, 2019 takes things to the next damn level. After seeing the new Heritage collection in person, I can say unequivocally that Davide Cerrato has elevated Montblanc right up there with the best in terms of design. My favorite? 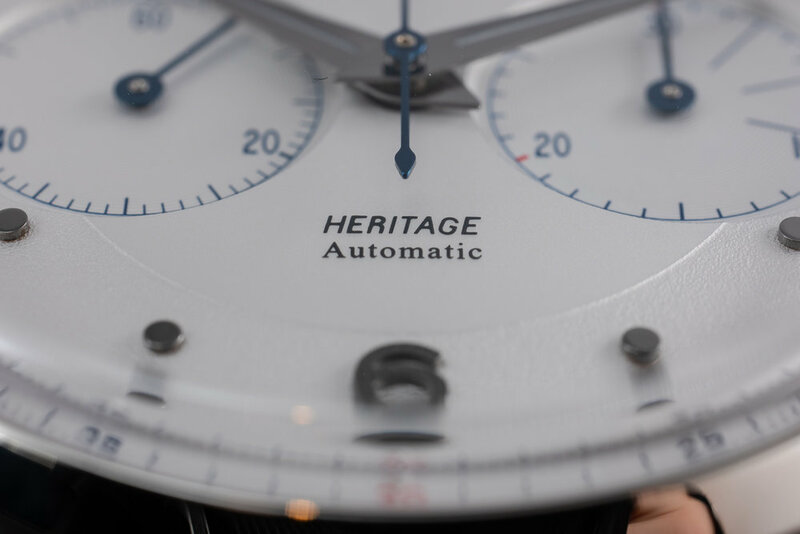 The new Heritage monopusher, which takes its design cues from classic Minerva chronographs. At once original, yet still deferential to the traditional design cues that defined the classic era of the chronograph, it’s a watch that can hold its own in virtually any situation. Suit in the office? Tux at the opera? Jeans and a T-shirt on the weekend? Check, check and check. All I ask is that you deliver mine on the milanese bracelet. 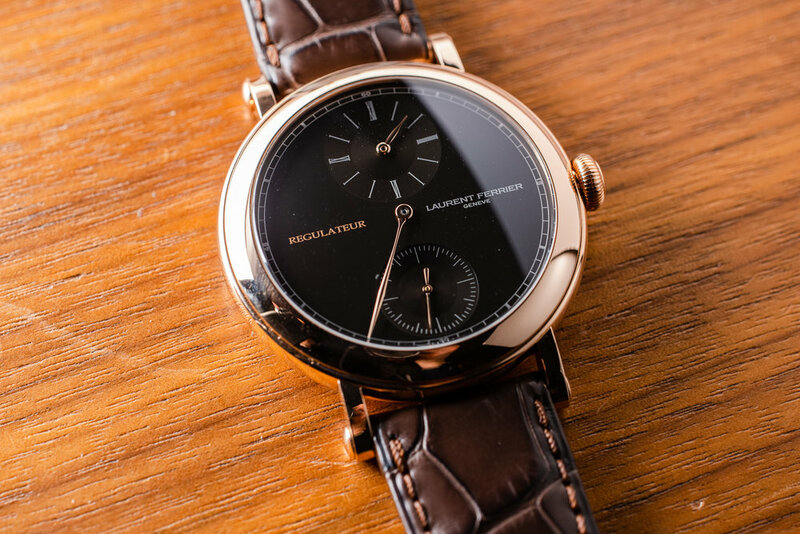 The collection includes a proper 3-hander, a novel day-date, and GMT in both steel and rose gold. There’s also a halo piece with a true Minvera manufacture movement, the Heritage Pulsometer. Only 100 will be made, but with a list price of approximately $28K, you’re gonna need some deep pockets. Well, deeper than mine, at least. 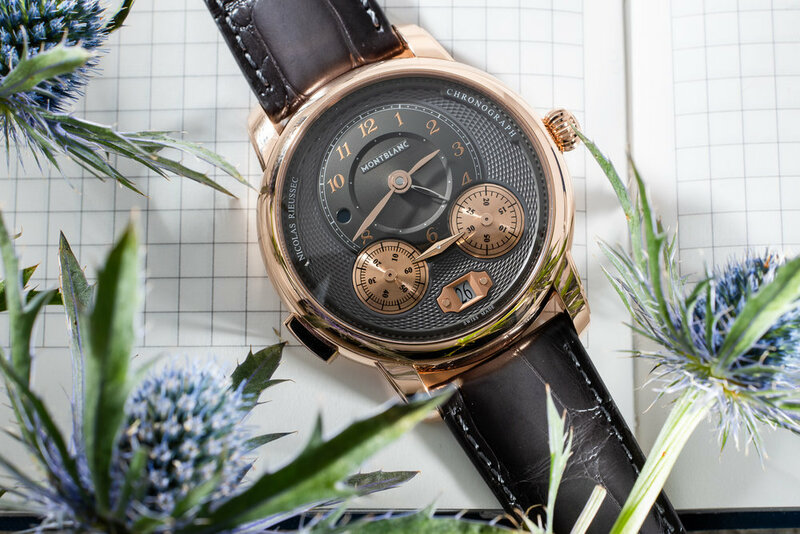 There offerings are rounded out with bronze versions of the 1858 Geosphere and Chronograph – both with green dials, a rather popular combination this year, don’t you think? – and the range-topping 1858 Split-Second Chronograph, also in bronze. 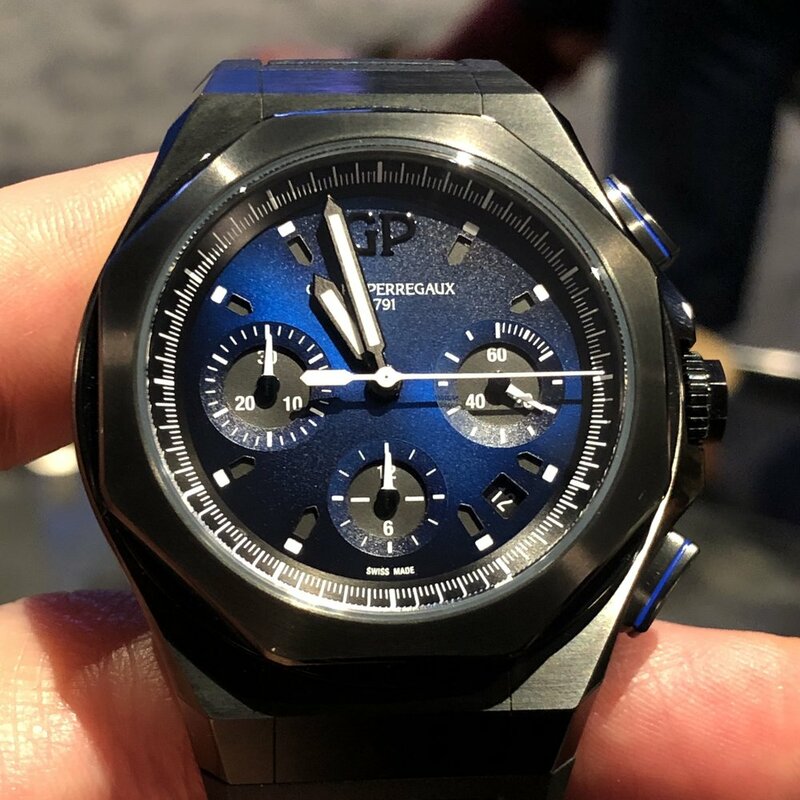 Now to our final stop of the show, Girard-Perregaux, who’s theme for 2019 was “Earth to Sky.” This year saw the release of the Laureato Absolute, which, as the name implies, lays stakes as the ultimate expression of the Laureato. Often derided as an also-ran in the Genta stakes – an unfair assessment, in my opinion – the new Absolute comes into their own with over-sized 44mm DLC titanium cases and gradient blue dials. I have to say, it’s interesting to see G-P going large when the trend seems to be to move in the opposite direction, but the watches wear quite well. Black is slimming, right? The collection includes a three-hander a world-timer and a chronograph. None of the movements are new, but all are in-house, which is the case for all G-Ps. 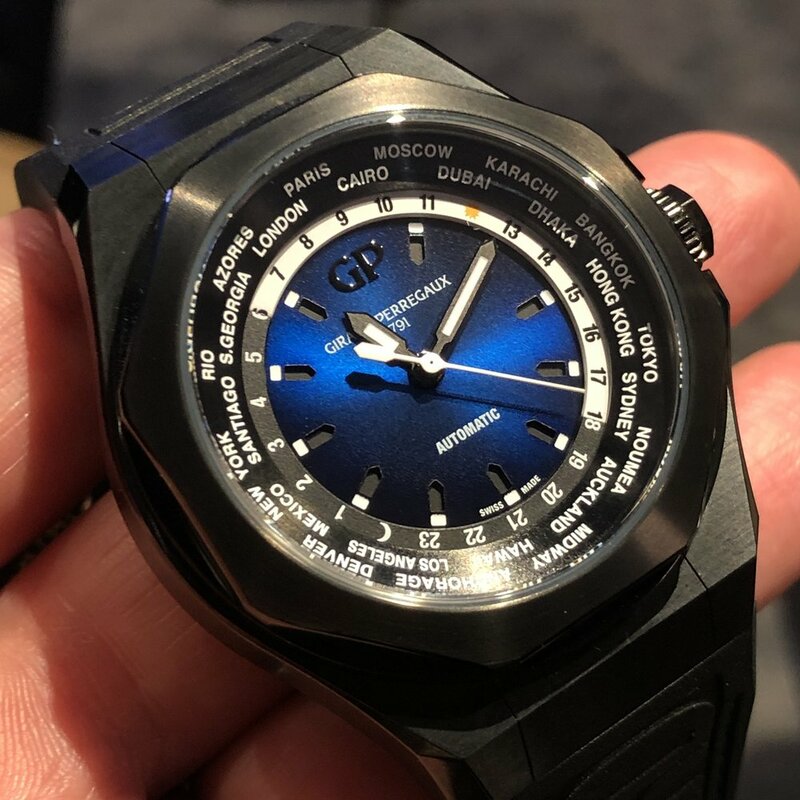 G-P also introduced a new case material Carbon Glass, which continues the blue/black theme and a more traditional Laureato with a new perpetual calendar movement. This wouldn’t be G-P, however, if they didn’t drop an insane haute horlogerie piece on us. 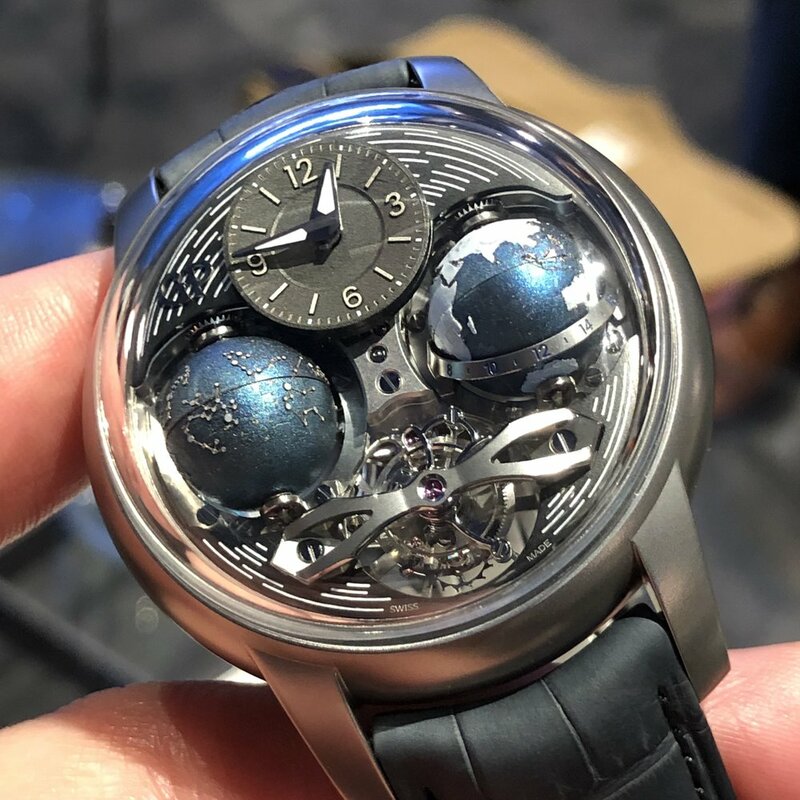 This they did in the form of the Bridges Cosmos, a flying tourbillon with dueling spheres that depict both the earth as it rotates on its axis and the 12 constellations as they’re seen in the night sky. It’s the ultimate embodiment of G-P’s “Earth to Sky” theme for 2019 and insanely cool to behold in person, particularly in the dark thanks to its liberal use of lume. Before I could call it a day – and, indeed, a show – I promised my friend Phil Ogle of Urwerk that I’d stop by and check out a very, very special piece: the $2.7 million AMC Atomic Master Clock which pairs a mechanical Urwerk timepiece with a 55lb autonomous atomic clock docking station.A decade in the making and inspired by Abraham-Louis Breguet’s “sympathy” clocks, in which a pocket watch could be docked and regulated overnight, Urwerk’s version takes the concept nuclear. When docked, the atomic master clock winds the watch, sets the time, and adjusts the regulation. Each time the watch is removed, the time is set down to the nanosecond. Amazing and totally worthy of a supervillain. Indeed, you’ll need supervillian-level funding to own one, but given that only three will be made – one of which has already been sold – the price seems right to me. Also on display was the UR-105 CT “Maverick” in bronze, a proper jaw-dropper in its own right with its rugged case, flip top, satellite movement and turbine impellers. I’ve said it a million times already and I’ll say it a million times again – I need more money. Ugh. So ends SIHH 2019, at least as far as the Palexpo is concerned. Given that Wednesday night is still technically part of Wednesday, I was scheduled to attend yet another brand dinner, fittingly enough with G-P. But before I could head over, first I had to check out of my hotel and move to an Airbnb in the Red Light district; SIHH only pays for three nights, and the joint ain't cheap. The Red Light district on the other hand is. Once I was settled in, it was a brisk walk across the river and through the Old Town to Cafe des Banques, where I met up with (among other folks) my friends Laurie from The Hollywood Reporter, Josh from Watchonista and Marc from Watchtime. Our hosts were none other than PR man extraordinaire and one the brains behind Watches & Wonders Miami, Jim Kloiber, Francois-Xavier Hotier, G-P/UN President for North America, and Leah La Marca . We ate, we drank – drank some more – and made merry. Needless to say, we were all exhausted, but happy to have notched yet another SIHH under our belts. After dinner, I back to my crappy Airbnb and proceeded to sleep for 24hrs straight. ‘Til next time.